Stay down longer and get back in the water sooner! Knowing that your dive time is limited at depth, you might want to look for a means of extending your no-decompression limit. Scuba diving with Enriched Air Nitrox does just that – especially on repetitive scuba dives. You will also feel less tired after diving, less drowsy and your surface intervals are way shorter! What a way to dive! Day One: You will meet with your instructor and complete your paperwork and receive your the text book. Day Two: After reading the manual and taking a short test, you’ll spend an hour or less with your instructor to practice analyzing oxygen content in your scuba tank and learning to set your dive computer for diving with enriched air Nitrox. 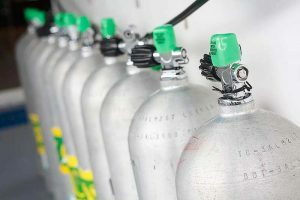 Once done simply analyze 2 tanks before your next dive and we register you as an Enriched Air Nitrox diver with PADI.